Although I paint abstract for myself, I’ve been taking classes to learn how to draw and paint realistically. I’m doing it so I can apply these skills to the paintings I imagine. I don’t need lessons to paint what I see with my mind, but in these classes I’ve been trying very hard to paint things the way I see them with my eyes. Which has been somewhat stressful because apparently, my eyes do not see things the way other people’s do. Sometimes I know I’m completely off the map, but other times I feel like I’ve aced what it is I’m replicating only to be told that the shadow is in the wrong place, or the perspective’s off, or the color doesn’t match. So I’d rub it out and try to fix it, and usually feel less satisfied having done so. And then one class, I just said no. We were painting landscapes. I was working from a full color photograph, long shadows crossing a country road awash in a sea of emerald, kelly and chartreuse. I began with the honest intention of giving it a serious go…even mixed 11 subtly different shades of green. Then, midway through, as I held my brush before my mostly black underpainting about to make the first leafy green stroke, I decided I liked it the way it was. When the instructor came around I announced I was finished and received a raised eyebrow as I took it off the easel. I spent the rest of class smashing the 11 shades of green around on a fresh piece of paper. I have nothing against highly realistic art; I find much of it very beautiful. I admire the skill that goes into creating it. After having spent many class hours struggling to make things perfect, however, I can’t help but feel like there’s something math-like about it. An equation with a pre-determined correct answer. Whenever I began one of these pieces with that goal in mind, it felt as if I were just filling in the blanks to achieve a result that never quite measured up. There are many amazing artists who create work based in realism that is stunningly distinctive. If you think about it though, what makes it so interesting is the artist’s own unique interpretation. The parts of the painting that do not reflect reality. When you’re painting entirely abstract, you quickly come to learn that there are a lot of people out there who need to know that you have the chops to accurately reproduce a bowl of lemons or a face or a fall landscape in order to accept the fact that you’re painting things that don’t look like any of the above. I decided that I’m not so bothered by that anymore. I wonder if de Kooning or Kandinsky had to submit a portfolio of tightly rendered architectural drawings or photorealistic fruit in order to get into galleries. Maybe they did. But that’s not what they’re remembered for. I plan to continue working on shading objects in space and mixing colors and getting my hand to do what I want it to do. Getting a handle on realism is good practice. That having been said, I’m done killing myself to be perfect. I hadn’t known it, but it was actually a form of suicide. Perfect means fitting yourself into a pre-exisiting idea of how things should be, one that’s usually imposed from outside. It’s a great way to set yourself up for vicious disappointment and provides endless opportunities for self-criticism. I took that approach my whole life with just about everything I did. Screwed myself up big time in the process. In my case, the desire for perfection acted as a governor on my ability to try new things, eventually shutting me down completely. Why bother when I’m only going to fall short of my own expectations? The resultant pain and self-punishment was too much to bear. Something about painting abstract unhitched all that. As I’ve gone down this path, I’ve seen first hand how the imperfect can be so powerful and so moving and and go so far outside expectation that it destroys all preconceived notions of what constitutes art. It showed me just how limiting my perception of reality was. And how limiting my addiction to perfectionism has truly been. My goal now in these classes is the same as the goal for my abstract work: to make a painting. Wherever that might take me. After all, what’s the point of going through the effort of getting something on the paper if you end up looking at exactly the same view you had when you started? Where’s the adventure in that?? So many things to say, let my ramble begin. Perception, art and consensus, which of these don’t belong. Consensus is the currently most agreed upon myth or paradigm. You know, the world is flat…an ice age is nigh…there’s a difference between the two main political parties… To me, there is nothing more limiting, blinding and dangerous than consensus. But alas in walked art. Where the brave dared speak of an emperor’s lack of clothes. Also, when you’re a free agent on the fringe of society it is art that gives you a sense of intimacy, it’s a wink and nod to fellow explorers, “you’ve seen it too!”. I like my art brave and as unscathed by the conscious mind as possible. I love the painting at the start of this blog! 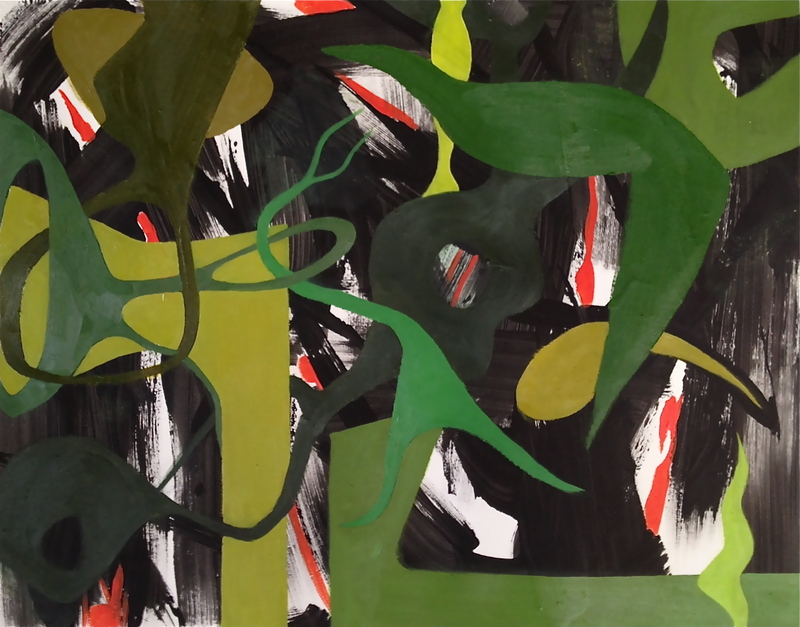 Wonderful interweaving and layering of the flat green shapes and lines – and all at a different place in space from the brushy black strokes and red-orange shapes further back. Intriguing painting, full of mystery!